The Shimano Ultegra line brings professional-grade racing technology to the practical, everyday road cyclists. By improving upon the design of the previous Ultegra bottom bracket, Shimano was able to make the 6800 series Ultegra bottom bracket smoother and lighter than previous Ultegra bottom brackets while remaining completely backwards compatible with existing cranksets. The BBR60 bottom bracket weighs in at a mere 77g, a whole 14g lighter than the 6700 bottom bracket which is due in part to the smaller bottom bracket cups. These smaller BB cups require use of the included TL-FC25 adapter to install and remove by simply attaching to your existing bottom bracket tool. The new design also reduces friction by 50% compared to a 6700 bottom bracket by improving upon the seal design. The new 6800 series Ultegra bottom bracket is completely backwards compatible with any Hollowtech II crankset, making it the perfect match for any cyclist. Backwards compatible with older Road Hollowtech II cranksets such as FC-6600, FC-5600, FC-7900, etc. I got this bottom bracket to replace my aging 6700 BB. Wow! I thought the "lower drag seals" was all marketing mumbo jumbo but this bottom bracket operates considerably more smoothly than the one it replaced, even compared to brand new 6700 BBs. The crank now spins multiple times when spun in the frame instead of hardly once. Not that it really feels any different while riding... but every watt helps right? This bottom bracket is also definitely lighter and lower-profile than the older BBs. Looks really nice with the black anodizing. The best thing about this bottom bracket is the smaller diameter plastic tool used to install it. Because of this, it's impossible to overtorque the bottom bracket, and also the plastic tool protects the aluminum splines from being cut by the tool, so it stays looking good even if you have to move it from frame to frame. Totally recommended for anyone needing a new road Hollowtech II BB. this thing threaded right into my bottom bracket shell and now my pedaling is as smooth as butter. mission accomplished. Great product and the shipping was extremely fast. Great product at a great price. Can't beat it. Converted my road bike to a external bb and I am much happier now. Delivery was actually the day before it was promised. Bought this for my touring bike to replace the old one that had 6k miles on it. New one fits great and spins well. Quality seems better than my old one. Would buy again. Bought this to go with a new ultegra crankset. It's lighter than the old one and I like the black color. Great bottom bracket at a great price. I have never had one fail yet. Super quick delivery - thanks! Arrived fast and was a great addition to my cx crankset! Compatible with my 105 crankset. Went in easy, but I needed grease and a bottom bracket removal tool. The lockbolts are smaller than the older ones so it comes with a slip in adapter to fit your bottom bracket removal tool. Great replacement for the FSA Mega Exo bottom bracket. also includes the adapter to use with the fsa tool. Excellent BB for any Hollowtech II road bike. Replaced my 6700 series Ultegra BB which fail after less than 2000 miles. This bottom bracket seems to be a huge improvement, as the other review states, it definitely spins more freely, is lower profile and looks much better in my opinion. So far I have about 500 miles on it and no issues, we will see how this one holds up. Highly recommend. Jenson has a great selection and better than competitive prices. The price on this bracket beat everyone else I found online (in the US). I'll be back for more, Jenson has top-notch Customer Service! I bought it because the Tiagra BB was worn out after 15k-20k miles / 10 years on my touring bike. The result is just amazing. The ugrade improved the smoothness of the pedaling significantly. It is like riding a brand new bike. It was also very easy to install with the appropriate tool (Park Tool BBT9). So far, I have riden 400 miles with the new BB. I definitely recommand this component. The bottom bracket on my commuter bike was shot and needed replacement. After a little online research I found that the Ultegra model would be compatible. I readily found this on Jenson at the best price available, ordered it Saturday and it was on my bike by the following Tuesday. Its been working great since, much tighter fit for the crank and very smooth turning. As usual with Jenson, the right part at the right price at the right time. It fits the bike and it fits the crank. I was glad they provided the adapter to install it with my BBT-9. Otherwise you need to get yourself a BBT-59. Good to know. Product showed in good shape. Nice quality and arrived 4 days earlier than expected. Installation was easy and made a difference having a new Bottom Bracket. Installed easily on my 10 year old bike as part of the upgrade from 10 spd to 11 spd. Functions well with Ultegra crankset. Easy replacement, direct fit. Great price. Fast shipping. Easy directly replacement. Make sure you have compatible tool--smaller cup diameter vs. older outboard bearings. Best price online, fast shipping. I've used the BBR60 before and had great luck with them. It's my go to bottom bracket for Shimano road builds. Jenson pricing makes it a deal. I am pairing this to a 5700 105 group on a build of 2008 Eddy Merckx . Right parts at the right price. Fits exactly as its supposed to, and included an adapter for my old bottom bracket wrench. Matching crankset fit perfectly. Compared elsewhere, Jenson has the most competitive price for this item and with the added service and customer support, it's a no brainer decision. The fitting tool is included in this model so don't let that discourage you from purchasing this! Installation was a breeze, just be use to thoroughly clean out those threads and be generous with your grease of choice. The bearings spin fine and smoothly with a 105 crankset through them. With respect to any classic build or BSA shell BB, this is going to be my bottom bracket of choice. 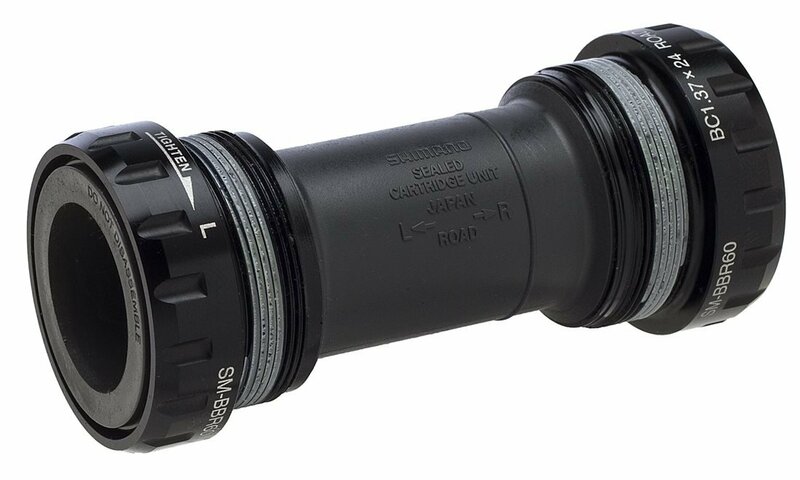 If you're not looking for luxury or racing at the elite level, this bottom bracket will last you years and will look damn fine on your bicycle. Fit beautifully on an old Centurion LeMas RS road frame with modern 105 5700 series components. Good bottom bracket. Easy to install. I have about 3000 milesonit now with no issues. Yep, Shimano works great. Have two of these and no issue. Fit my FC-6800 Ultegra groupset as a replacement for a worn part. That said, my build was delayed an extra week since Jenson didn't send out the BB with the rest of my order. Not sure what the reason was as all the parts I ordered were "in stock" but everything I needed to build arrived in time for the weekend build, except the BB. That's one thing 'the other' online seller has a leg up, they offer free 2-day shipping. lightweight. smaller wrench size than 105, but comes with adapter. Have about 200 miles with it, so far no issues. Vey nice and smooth ride with this product, very light. I commute daily over 12 miles, just upgraded to the new 105 drivetrain with this bottom bracket. Very nice. Replaced the old bb on my cx bike. Way better quality than what I replaced. The B/B installed easily, which is a good thing, because the adapter ring supplied with the B/B didn't really fit my Park Tool, BBT-9. I couldn't completely insert the adapter in the wrench, because the wrench actually compresses the adapter enough that it doesn't slide on the B/B. It was enough to get the job done. Is the Shimano Ultegra 6800 SM-BBR60 Bottom Bracket compatible with my Shimano Ultegra fc-6603 triple crank set? BEST ANSWER: This bottom bracket is backwards compatible with any Hollowtech II cranksets, so yes, it should fit fine. I own a 2017 Specialized Tarmac Comp, which as the Ultegra 6800 crank with Shimano BB, will the 2018 S Works/ Praxis Crank work with this? 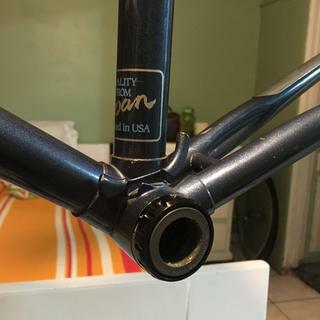 What shell size does this bottom bracket fit? BEST ANSWER: This bottom bracket fits 68mm English threaded shells, or, if you choose the "Italian" option, 70mm Italian bottom bracket shells. Does not fit 73mm MTB shells. What type of bearings if any comes in this bracket? If none what size does it holds? BEST ANSWER: Of course there are bearings, it's a bottom bracket. Interior diameter fits Shimano Hollowtech II, exterior threads are standard 68mm. You must figure out whether your threads are English or Italian (most are English). The bearings, which are external of the BB shell, come with the bottom bracket. Just make sure your crankset is compatible to an external bottom bracket. It has typical sealed bearings in it. I have a Specialized Sirrus Comp Carbon (2017 model). It lists the "B-B Drop" as 70mm. Does that mean the Italian version would fit my bike? BEST ANSWER: No, that is a geometry measurement. Go to Specialized's web page and check specs for that particular frames bottom bracket requirements. This BB will fit an English threaded 68 or 70 mm BB shell. Look up Italian threads on google bike man for you has a good YouTube explaining the difference. will this bb work with FSA Gossemer crankset ????????????? BEST ANSWER: No, you'll need a FSA bottom bracket for that. Will this fit a bianchi super pista? It says BSA 68mm english threaded. BEST ANSWER: If the frame has a 68 mm English threaded bottom bracket shell, this bottom bracket is the correct one. I'M rebuilding a Cannondale 6 frame. I removed the octal ink shimano bb-6500, 68, bc 1.37x24, L--118.5--R. Will this model fit? BEST ANSWER: Yes. Fits older style threaded bottom brackets with English threading.